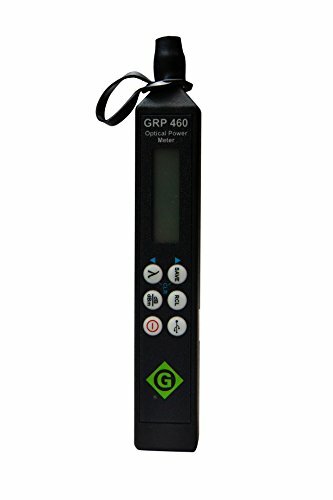 The Greenlee GRP 460-04 Optical Power Meter with InGaAs Filtered Detector measures optical powers from +23 to -45dBm. Downloadable measurements for easy reporting is convenient. It is also adaptable - it interfaces to all industry standard connectors. Features Single mode and multimode application. Calibrated wave lengths of 850nm, 1310nm, 1490nm, and 1550nm. Data transfer via USB. Stores up to 1000 measurements per wavelength. 2kHz Tone detect. NIST traceable. Long Battery Life. Dimensions: 6.1 by 0.94 by 0.75 in (15.5 by 2.38 by 1.90cm). Weight: 3.0 oz. (85g). Mini fiber TOOLS are rugged, small and lightweight and are designed to be use in demanding environments. These tools are used in a variety of markets including Telco, MSO, CATV, Utility, Government/Military, and anyone else involved in installation and maintenance of fiber optic cables and networks. Made in the USA.